Homeward Bound Dog Rescue (HBDR) provides rescue to many dogs and transports them to their New York headquarters. They are experts with momma dogs and babies. Recently they rescued a pregnant Boxer, and on Thanksgiving seven puppies were born. Now that the puppies are weaned, the momma dog will go to the family who found her and was initially caring for her. They will take care of her medically. We provided partial funds to have the babies tested and altered, and for their health certificates so they can be transported. We also assisted with Rhett, a heartworwm-positive dog pulled from the Blount County Animal Shelter. Homeward Bound Dog Rescue pulled a surrendered momma dog and nine of her puppies from the Oak Ridge Animal Shelter. One puppy didn’t make it, and the momma turned on some of the pups, so HBDR had to bottle feed them. We sent about half the funds needed for vetting needs for all ten dogs. Homeward Bound Dog Rescue took in a mama dog and her puppies. Before they could send the dogs to their headquarters in New York, all of them needed to be altered, vaccinated, chipped, dewormed, and have health certificates. The cost was going to be around $650. We kicked in $500 for this brood. Stanley and Scooter are eight week old pups that were found on the side of the road. They came to Homeward Bound Dog Rescue when they were about five weeks old. Because they did not come from a momma dog and may have been lacking in basic antibodies, they had their vet prepare a blood serum from a healthy mom, dewormed the pups, and gave them two rounds of shots. HBDR’s expenses on these little guys were up there, and when they reached out to us to help with the remaining costs ($125 per puppy) for final exam, neuter, and health certificate, we were happy to pitch in and help. Shelby was pulled from the Blount County Animal Center by Homeward Bound Dog Rescue (HBDR). She’d had five puppies, and only two, Peter and Paul, survived Parvo after much supportive care, paid for by HBDR. 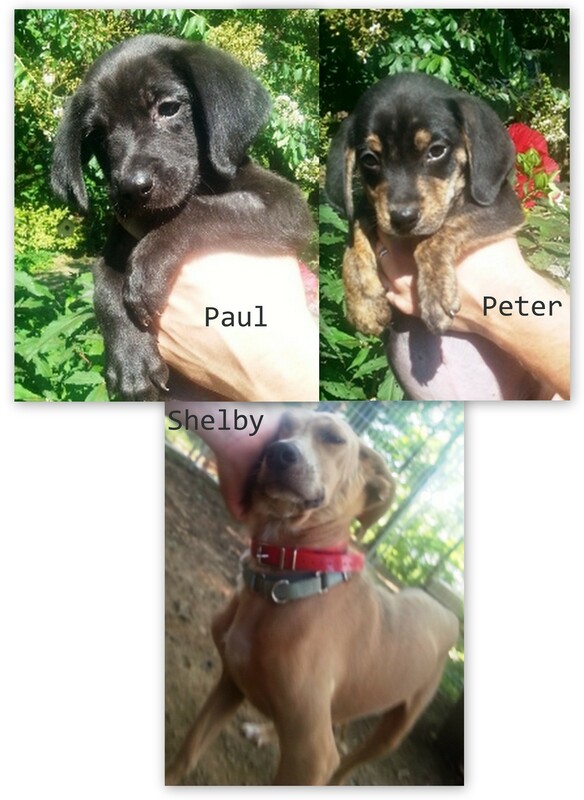 Once the three were well and ready for rescue, they needed to be spayed and neutered and given booster vaccines. That’s where HPAN came in. We paid for these services for all three.